As the New Year dawns, many of us make a noble list of New Year’s Resolutions. 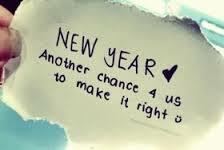 A brand new year seems like a gift, a fresh start, a clean slate, a chance to turn the page to a new chapter in our lives. We usually start out the month of January with grand intentions and high ambitions, but we find that we often lose that enthusiasm as the days and weeks click past. Our list of resolutions gets buried under the stack of papers that we intended to organize, and we forget about all the things we resolved to do over the next 365 days. The truth is that we should live each new day with resolve and intent. God has given us a certain number of days to fulfill our life’s purposes, and we should ask Him to give us the grace to understand the important significance of each day (and each moment) that we spend here on earth. Some of us have more time than others, but none of us know the exact amount of time that we have left to complete our life’s mission. We should diligently pray for divine instruction concerning how to use our time throughout the days of our lives. Thoughtful time management is an excellent art whether you’re a business professional, student, homemaker or retiree. God models time management for us when we consider the account in Genesis 1 of His orderly creation of the universe; each day was filled with important tasks and accomplishments, and He even set aside time for rest. When you number your days to good purposes, according to God’s guidance, you will live wisely and your heart and mind will be inclined to achieving God’s mission for your life. So instead of making a list on the first day of the new year of things you want to accomplish in the next 12 months, you should make a list as you begin each New Day. It might be helpful to write your daily list on a calendar or in a notebook, so that you can look back over the year and see all the things that you and God have accomplished together. Live each New Day as though it were a gift of time, a new beginning, a fresh start, and a chance to fulfill God’s grand purpose. If you order your days according to God’s plan, rather than your own desires, you will feel a divine sense of fulfillment each day of your life, and no moment will be wasted.